Thank you to the two students who want to share their knowledge about Schizophrenia. We need people like you on the earth! This blog is created by two college students who have a goal in mind. To educate the public about the seriousness and frequency of schizophrenia occurring in the United States through WordPress and persuade the viewers to donate to The Mental Health Research Association (NARSAD) for scientific research on schizophrenia. You may be thinking “Why does this relate to me?” or “Why should I care?”. The answer is simple. You may not know it but schizophrenia affects 2.4 million people in the United States. Though it may seem small, it can affect an entire society in an instant. Frequency of schizophrenia throughout the United States. Family members, relatives, friends, and more have to face the struggles of having someone they know diagnosed with schizophrenia. It is not just an illness that affects the victim, both others who are affiliated with them as well. Schizophrenia is a mental disorder characterized by a breakdown of thought processes and by a deficit of typical emotional responses. What this basically means is that a person suffering from schizophrenia cannot think clearly and does not experience a wide range of emotions that a normal person would. To learn about schizophrenia’s causes, symptoms, treatment, and more, visit http://www.ncbi.nlm.nih.gov/pubmedhealth/PMH0001925/#adam_000928.disease.causesto quench your thirst for knowledge. 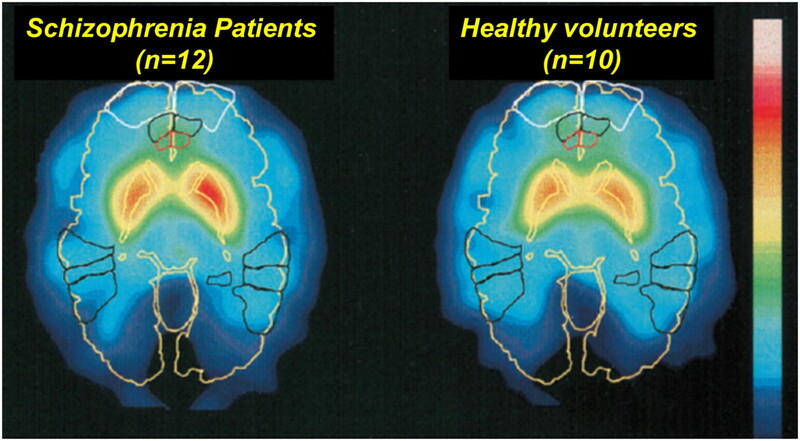 Comparison of schizophrenic brain and normal brain. Timeline of therapies for schizophrenia. Because of this, not only does the the victim suffer but also people who are in contact with them on a daily basis. Schizophrenia has biological, emotional, social financial, and familial effects that can be discussed in more detail by visiting http://www.ehow.com/about_4777972_effects-schizophrenia-family.html. It can be a stressful time for everyone once the symptoms of schizophrenia are in motion but there are support programs that can help ease into this transition for everyone affected. One of them is http://schizophrenia.com/coping.html which helps only only the person with the illness but also family members as well. After reading about this blog post, you probably have learn a lot about schizophrenia and now want to do something about it. If you have, then we accomplished our goal. If not, we at least hoped you have gained a better understanding of this issue and are now more aware on its affects in society. If you do want to help out with this prevalent issue, please go to http://schizophrenia.com/donate_vol.html# to learn more about how you can donate money to aid in groundbreaking research on schizophrenia. Thank you for taking the time to read about this problem and hopefully you have been informed on the realities of schizophrenia.